A picture of early misty morning on Li River (Lijiang River) near Yangshuo city in Guangxi province in China. Recreational cruise boats awaiting tourists for cruises on crystal-clear waters of Li River that twists and turns between magnificent and beautiful carst mountains. This image belongs to the travel and nature stock photo library. This stock photo of Early Morning on Li River Near Yangshuo is available for licensing for commercial and editorial uses including websites, blogs, books, magazines, brochures and advertising. Restrictions may apply for images which contain third party copyrighted material or sensitive subjects. Photos of artwork are for editorial use only. 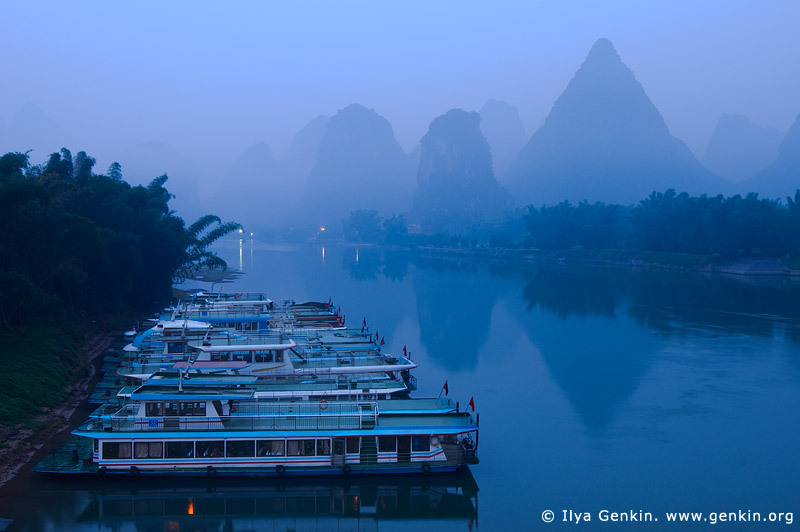 This image id CHINA-YANGSHUO-XINGPING-0005 of Early Morning on Li River Near Yangshuo, is copyrighted © by Ilya Genkin. This is not a public domain image.